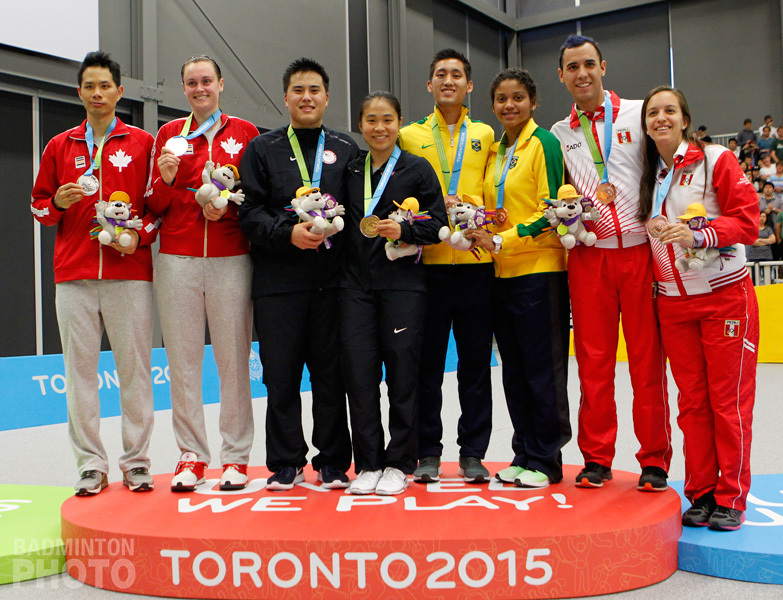 Phillip Chew took his second badminton gold at the Toronto 2015 Pan Am Games while hosts Canada finished with just one. Canada may still be far in front as the all-time leader in Pan Am Games badminton medals but Toronto 2015 is the continental power’s most disappointing showing in the twenty-year history of the sport’s inclusion in the Games. Visiting shuttlers denied Canadians a second and third gold on Thursday, making the all-Canadian women’s singles final the only gold mine for the home team. Team USA, meanwhile, equalled its best showing with three golds. They did it in 2007, relying on Eva Lee for all three, and this time Eva contributed one while Philip Chew was involved in the other two. 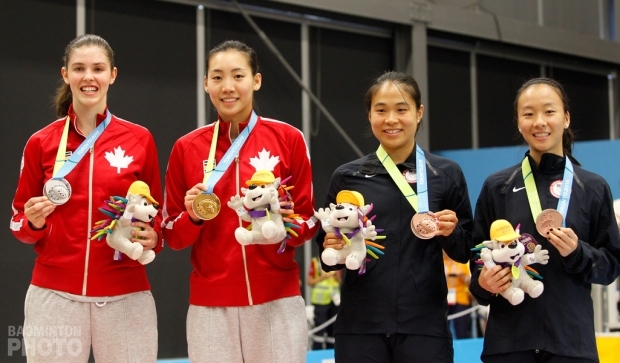 The Pan Am Games has had at least one player finish with two or three golds in all but one edition so Chew is part of a real tradition. 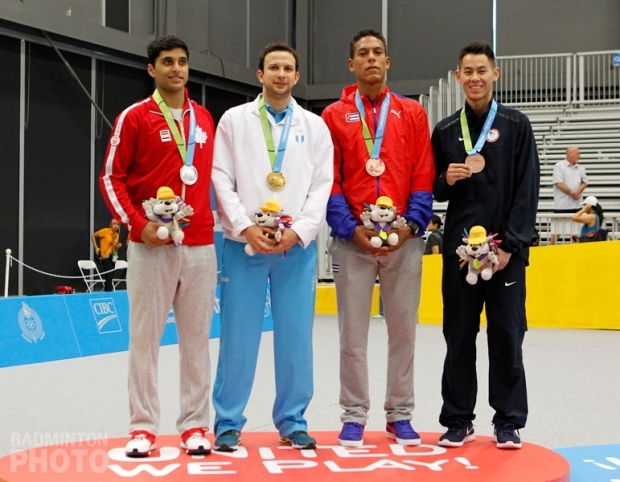 Phillip Chew and partner Jamie Subandhi (pictured top) had lost on each of the four occasions that they had played against Canada’s Toby Ng and Alex Bruce (pictured right), including in the final of last year’s Pan Am Badminton Championships. But while that was a close match last autumn, they were even closer in the final of the USA International Challenge the following week and it was that pattern that this match in Toronto began to resemble. The visitors looked at first to be in for an unexpectedly easy run to the gold. They trounced the Canadians 21-9 in the first game. But when they earned four match points at 20-16 in the second, things began to fall apart for them as they had in Orlando last year. This time, Ng and Bruce saved all four match points and then another to salvage the second game 23-21. However, unlike last October, they didn’t run away with the third game. Chew and Subandhi staged a 5-point run from 13-11 up in the decider to take the commanding lead the Canadians couldn’t run down and Chew ended up with his second gold. The day started off with another rematch from last year’s Pan Am Championships. In this one, Canada’s 2014 champion did pull off another continental victory and for Michelle Li, it was also a defense of her gold medal from four years ago. In fact, both women’s singles finalists hail from the Greater Toronto Area, as does mixed silver medallist Alex Bruce, so there was some poetic justice in this being the gold that would stay in Canada. Li, who is also the two-time reigning Canada Open champion and #15 in the world, won the match comfortably over the 19-year-old Honderich, with whom she also won bronze in women’s doubles this week. The closest thing to a Cinderella story in the Pan Am Games was Andrew D’Souza. He did come into the event as Canada’s national champion and he had beaten the two-time Pan Am Champion in the semi-finals but this silver medal in Toronto is by far the closest the 21-year-old has come to his first international tournament victory. With very little international experience, D’Souza is barely in the top twenty among Pan American athletes and this performance should move him into the top 200 in the world for the first time in his career. 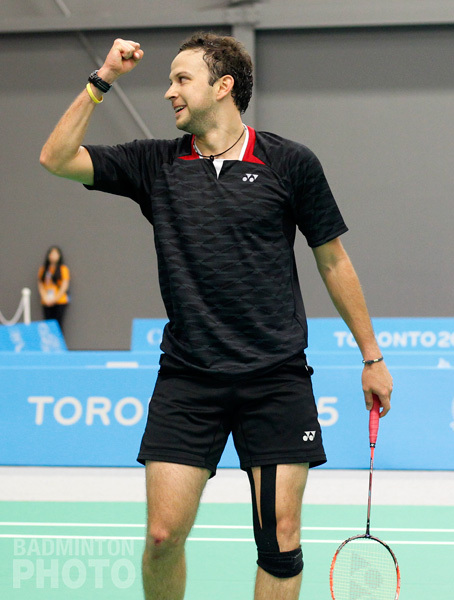 Across the net was the defending gold medallist Kevin Cordon (pictured), a seasoned veteran who was playing in the gold medal match of the Pan Am games for the third straight time. He also happens to be one of only three active players who have a winning record against World Champion Chen Long. Andrew D’Souza (pictured below) managed to keep things respectable but ultimately bowed to Cordon in straight games. Cordon thus once again became the only badminton gold medal winner from outside of the U.S. or Canada, as he was in 2011. What’s next in Pan American badminton? It is not unheard of for an otherwise dominant team – as Canada has been in Pan Am badminton – to have trouble rising to the occasion for a home crowd. 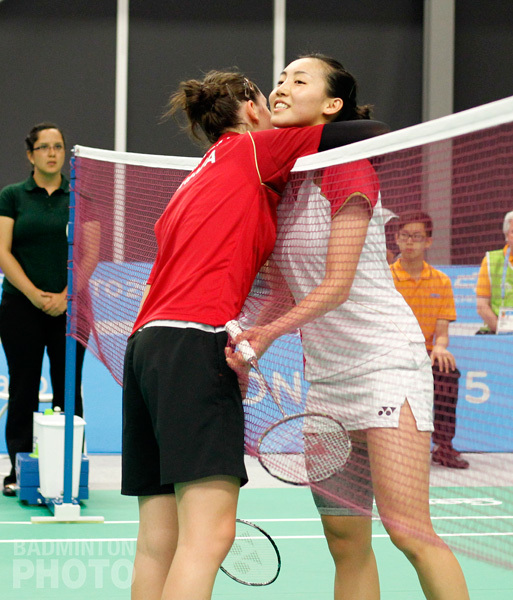 Even mighty China has had some of its most meagre badminton gold takes when it hosted the Olympics and later the World Championships. It is this – rather than Canada’s place in history as the only Olympic host (1976) to fail to win a single gold – that tells the tale of this year’s Pan Am badminton event. There are still plenty of indications that the nation will continue to be a continental badminton power. With all but one of the seven Canadian medallists under the age of 25, the future still looks bright and the disqualified men’s doubles favourites are at least as eager as all those in action in Toronto to keep climbing upward in the race to qualify for the Rio Olympics, only the second Olympics on the continent since badminton became a medal event. Speaking of the future, the next wave of badminton talent in the Western Hemisphere will soon be taking to the courts as the junior continental championships will kick off in Tijuana on August 5th.